Online : BookMyShow or you can optionally register at : goo.gl/forms/smbOaMlZR8T4P6ew1 for your complimentary passes and voluntarily donate at site. For 5 years old and above. Sponsors and donors will get priority access. 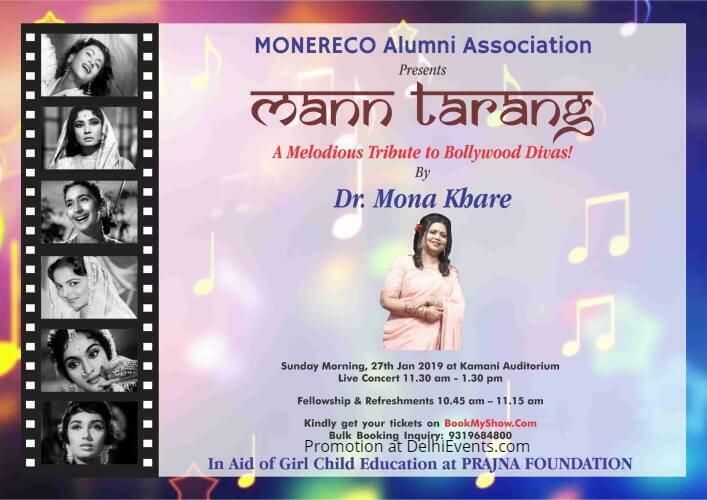 Event Description : MANN TARANG is a beautiful bouquet of melodious Hindi songs depicting the silver screen image of six Bollywood Divas of the golden era. Devoted disciple of Padma Shree Ustaad Abdul Latif Khan Saheb and known for her unique voice texture and versatility, Dr. MONA KHARE is paying tribute to Madhubala, Meena Kumari, Nutan, Waheeda Rehman, Vyjanthimala and Sadhna through their selected songs . Each song will reflect their individual persona & unique style that carved their own niche as female icons of the film world. The charity concert is in aid of Girl Child Education at PRAJNA FOUNDATION.